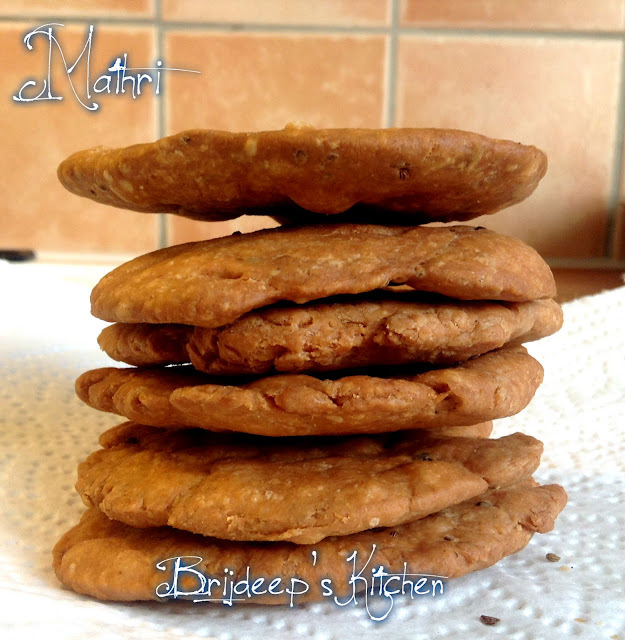 Mathri is a famous and popular snack in North India, which has many recipes and can be made in many ways. There are plain, spicy and many other different versions of mathri. 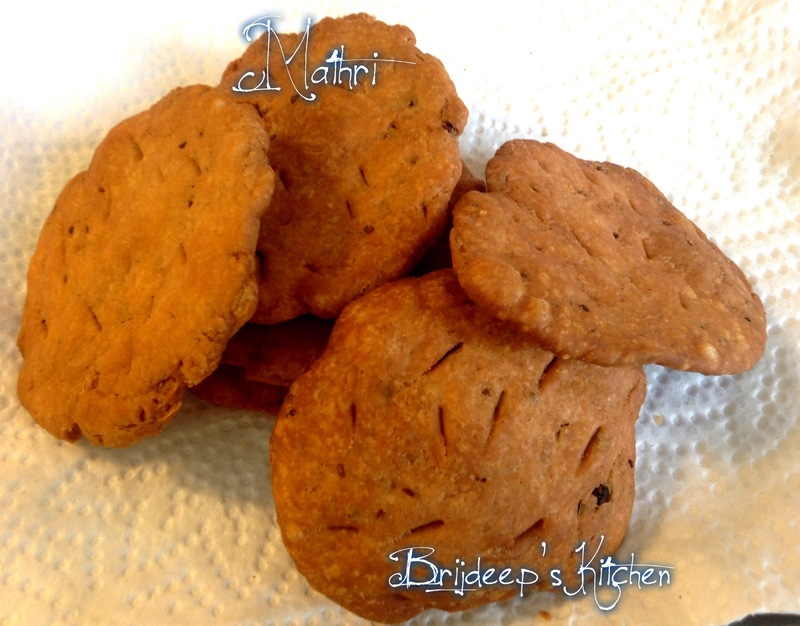 Being unable to bring any from India, and wanting to have something home-made and healthy snacks everyday with tea instead of the store-brought namkeens and all; I was inspired to make these. Mathris are being made every year in our home in big batches and stored in big containers and we used to devour them all year round. These were specially made during festive season of Diwali. Usually it's my maternal grandmother who used to make them, also my mother. So this recipe is being passed on to me from them. I tried to make these and they tasted amazing and was an instant hit. Easy to make, and can be stored in air-tight containers for increasing their shelf-life. As far as I know, they keep good for months together if stored in air tight containers, without any moisture, in a cool place. They can be kept on the shelf. 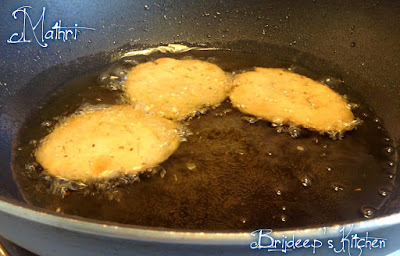 Needless to say, our house became fragrant with the wonderful aroma of the frying mathris that both me and my husband became nostalgic remembering the same aroma at our respective homes back in India.. !! 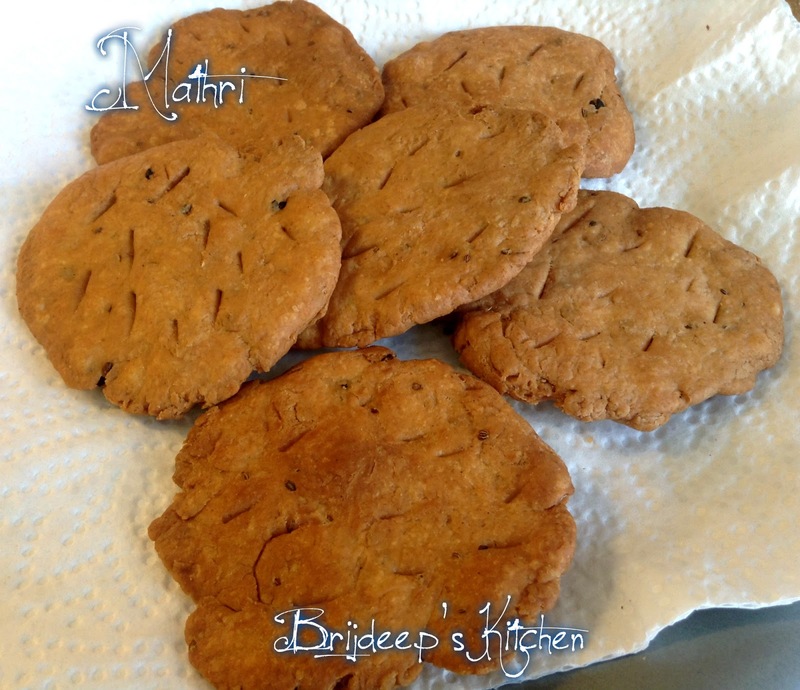 These mathris can be prepared with a mix of whole wheat flour + all purpose flour as well. Traditionally, these are made only with wheat flour, but the all purpose flour is added to increase the shelf life. I make these both ways, with only wheat flour and also with the mix of flour, as required. Mix the wheat flour, ghee, carom seeds, peppercorns and salt. Mix all of them well together with fingertips. This must resemble bread crumbs. Add little water, 1 tsp. at a time and mix the flour together. You don't have to knead the flour like for rotis or pooris, just binding them. So a little water will be enough. It will be hard bound together. I used 6 tsps. water. Cover and keep aside for 30 minutes. Make small balls of the mix; these balls need not be perfect like for rotis or pooris, just little balls. Press each ball between your palms and shape them to a small round, the shape can be uneven, it's okay. I don't use a rolling pin because it loses its flakiness the more it is rolled. Keep all the mathris and the balls covered at all times so they don't get dried out. 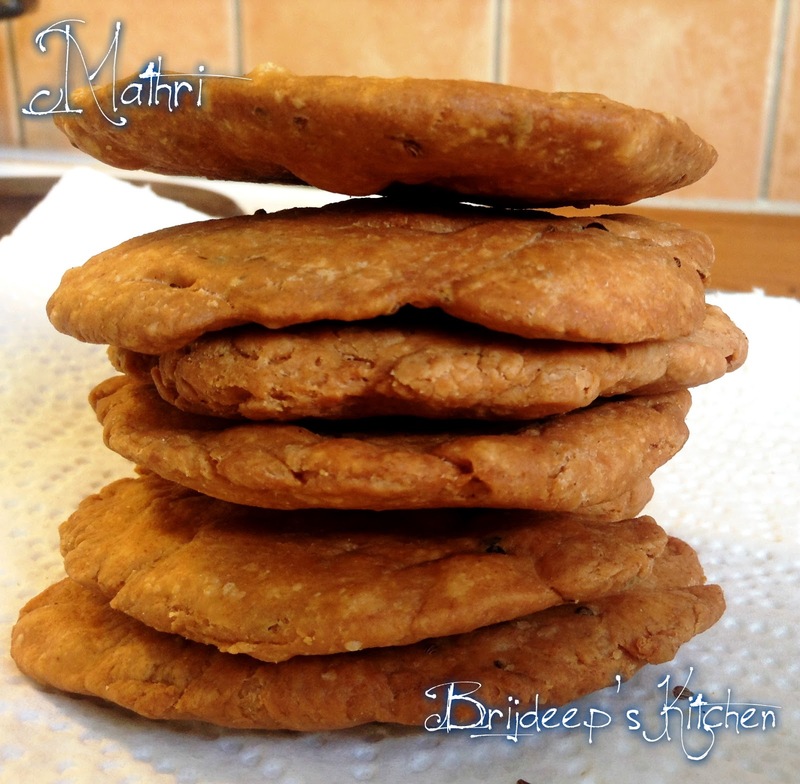 Prick at several places with a knife in each mathri so they don't rise up like pooris when fried. Now heat oil on MEDIUM flame and add the flattened mathris to the oil. I add 3-4 at a time, can depend upon the size of your vessel. Fry till they are crispy and golden. Turn occasionally. Drain the excess oil by taking them out on a kitchen paper. When cooled, store in an air-tight box.